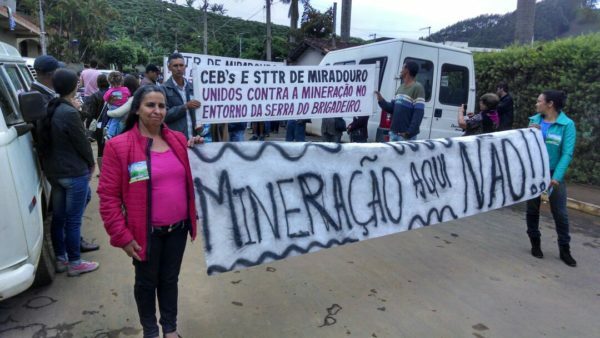 Miradouro and other municipalities in Serra do Brigadeiro resist against extraction of bauxite deposits by CBA, a company belonging to the Votorantim Group. Serra do Brigadeiro is a mountain range park located in Minas Gerais state. It was created in 1996 and open to public visitation in 2005. The mission of the park is to protect the natural heritage of the Atlantic Rainforest in the Serra do Brigadeiro, whilst facilitating scientific research, education and ecotourism, and contributing towards the development of communities in the area. Since before its creation, the area of the park has seen movements of resistance from the rural families living nearby it. Serra do Brigadeiro park encompass the following municipalities: Araponga, Fervedouro, Miradouro, Ervália, Sericita, Pedra Bonita, Muriaé, and Divino. It also contains several river sources which considerably contribute to the creation of two watersheds: Doce River and Paraíba do Sul River. Miradouro and other nearby municipalities in the Serra do Brigadeiro contain one of the largest bauxite deposits in Brazil. Due to the mineral presence in the region, many different companies are evaluating extraction possibilities and CBA is one of them. The company is part of the Votorantim Group. In this new "commodity extraction frontier", resistance groups are organizing themselves in the region to develop tactics and strategies to stop the insatiable demand of the world economy for aluminium in this new advance of potential mineral extraction. That has been registered in at least two Government authorities official reports. In 2004 the Territorial Plan of Sustainable Rural Development of the region mentions a meeting where more emphasis was given to mobilize communities and organizations to confront the venture of bauxite mining companies nearby the Serra do Brigadeiro Park. Between 2004 and 2006 a Regional Commission for the people impacted by mining was created. The coalition was composed of the rural workers union, CPT (pastoral land commission, of the Catholic Church) and a few NGOs. The Commission performed a lot of pressure during public hearings and environmental licence processes, preventing some projects to advance without proper local communities participation. It is considered one of the first coalition efforts against mining projects in Brazil. In 2006 the coalition was dissolved. In 2007 the Park management plan report as one of the land issues the growing external intimidation coming along with National Mineral Production agency (DNPM) support due to large bauxite reservoirs in the region. After the creation of a new national anti-mining mobilization (MAM) in 2013, these activists have helped the continuation of resistance in the region and in 2016 new protests were organized with Cáritas, CPT and the Federal University of Vicosa's support. In June 2017 MAM has published on their website a piece denouncing CBA. According to the activists, the company would perform strategies misleading communities members and leaders towards a favourable opinion on the bauxite extraction in the region. For that, via NGOs, the company would promote activities in order to "culturally appropriate" the community. Fernanda Oliveira from the Union of Rural Workers (Sindicato de Trabalhadores Rurais de Miradouro) said in 2017 that a general assembly declared the region as appropriate for conservation, for agriculture and tourism, the region should be demarcated as a territory free from mining (1). The conflict heated in 2017 when the priest Gilberto Teixeira from Muriaé said he has received a death threat during a protest organized in October of that year. In response to that, more than 70 social movement organizations like MST, MAM, unions and others wrote a letter in solidarity to the priest. The activists claimed for the right to protest against CBA project. Project Details CBA requested to the National Mining Agency in Brazil to do research and mining concessions in several municipalities around Serra do Brigadeiro region. However, in the company website and Votorantim Group 2016 sustainability report, there was no information about the company activities related to bauxite extraction nearby Serra do Brigadeiro in Minas Gerais area. Development of Alternatives (1) "Fernanda Oliveira, do Sindicato de Trabalhadores Rurais de Miradouro, a Assembleia cumpriu o objetivo. “A assembleia é um processo importante de mobilização e ampliação da consciência do povo. Pudemos fazer formação e organizar nosso time para derrotar o inimigo. Nossa região é terra para agricultura, para conservação e turismo, não é espaço para mineradora, por isso, reivindicamos coletivamente que a região seja demarcada como território livre de mineração”, reivindica Oliveira. Why? Explain briefly. It is still an ongoing process and the company have not started the construction phase yet. During an interview in 2017, CBA representatives said that although the company already has the right to explore the region, the activity is not in the company forecast for the next 5 years. (1) Public consultation is done in Miradouro (MG). A Comissão dos Atingidos pela Mineração e a Luta de Resistência à Expansão da Mineração de Bauxita (e a Favor da Agricultura Familiar) na Zona da Mata de Minas Gerais This academic paper (framed in social movement theory) describes the Commission of people affected by mining activities (bauxite extraction) in Minas Gerais.